I picked up the results of my playing with a Box Tengor the other days. 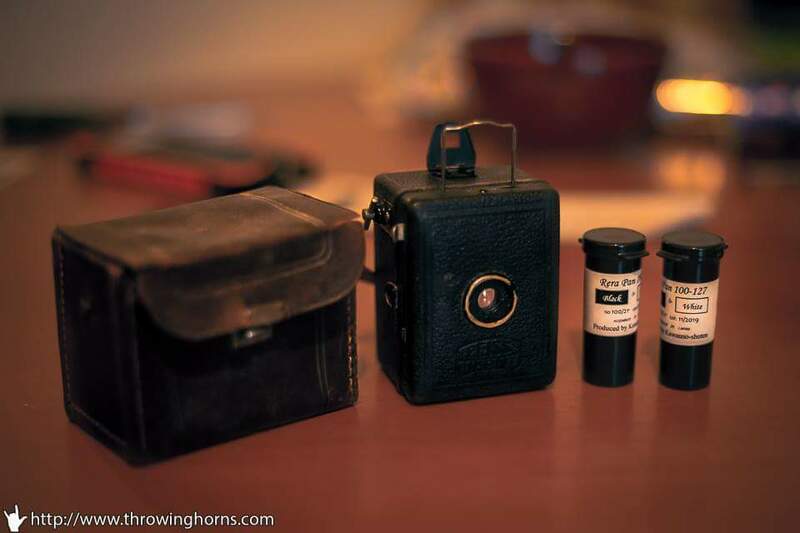 It’s a little metal medium format film camera from the 1930s. I had NO IDEA what I was doing. It has a fixed focal length, no ability to understand how much light the camera was getting, not controls for ANYTHING, so it really was quite an experiment. I picked up some Rera Pan 100 roll 127 film from Macodirect, which I think gives me 12 exposures, but we were initially a little confused about how to advance the film properly, meaning we didn’t get as many shots as we could. Quite a few of the shots were far too under exposed (taken in doors), blown out (taken in doors next to a window!) or too close (seems like you need to be more than 2 metres away from your target, but here are a couple I thought were worth putting up. It’s interesting getting “real photos” and negatives back. It’s been a long time! You can also see where the people developing them have really tried their best to get something showing on the photo. I’ve got another roll of film waiting for some inspiration. Any ideas on what I should try and use it for? Posted on 7th January 2017 28th March 2017 Categories Real Film1 Comment on Box Tengor!